AFTER many years of buying school uniform from the one and only stockist in Sale I am thrilled to finally have a choice of shop for the coming school year. Needless to say I have continued to go and spend an astonishing amount of money each and every year, as have countless other parents, as there was no alternative. Not any more. A new shop has opened in Sale Centre and stocks school uniform with one slight difference…..the price. Fusion X designs are situated at 22 Town Square, next to Grainger Games and have recently been approved by several schools in the area to stock their uniform. I became aware of the shop opening when I received an email via the school parent mail system pointing out that there was ‘another stockist’ whilst also reminding me that the previous stockist has been established for a long time and offered quality uniform. This seemed a little one sided and so I decided to go and visit the new shop myself, to view their stock and see for myself if quality had been compromised to cut costs or not. Fusion X designs is clearly well stocked with a full range of uniform, well presented and easy to get to. 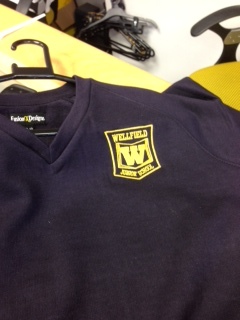 The staff were very friendly and happy to show me an example of their uniform, namely a Wellfield Junior School sweatshirt. The sweatshirt is spot on. It’s good quality fabric, perfect colour and has the school emblem on the left hand side in gold embroidery. Placed side by side with a sweatshirt from the other stockist it is virtually impossible to tell them apart. They are identical…..except the price that is. A trip to the older, more established school uniform stockist for a Wellfield Junior sweatshirt will set you back between £13 and £16 depending on size. The same top purchased from the new, recently approved and eager to get established stockist will cost you £9.50, whatever the size.